The world can be a boggling place for a child. There are so many difficult topics swirling around. How do we introduce and explain them? I talked about First News newspaper on Sunday and its ability to draw difficult things to our attention, such as war, refugees, poverty, and the environment. But if we want to go one step further and find the reasons behind things, the whys and hows, what we can do about these topics, and how we feel about it, then we can turn to fiction. Books are a great way to discover things about our world, and our place within it. Two stalwarts of children’s literature tackle the very tricky topics of animal poaching, child guerrilla soldiers, mining, deforestation and more, in two compelling books for children. Although book five of the White Giraffe series, this can equally be read as a stand-alone book, because St John beautifully summarises past happenings throughout the book, and the characters come across just as strongly as if you had read all the prior books. Of course it can also be read in sequence as part of this vibrant series. Martine lives in Africa with her grandmother, on a game reserve. 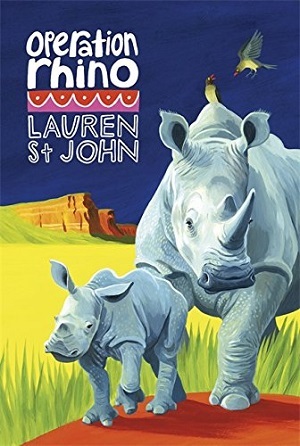 When their white rhinos are attacked by poachers looking to take the rhinos’ horns, Martine and her friend Ben accompany the surviving baby rhino to a sanctuary in the National Park. Whilst there, they try to play detective and work out who the poachers are, only to realise that they might have stumbled right into the poachers’ lair. Martine grew up in England, which affords St John the luxury of comparing things in Africa to things here – such as a train ride for example, which is particularly useful for her UK readership to draw parallels between the two environments and to see the differences. Her youthful protagonist also has a child’s outlook so can draw on a simple view of animal and human rights, which again, for her youthful audience means that complex arguments can be explained in a simple way or pared down. 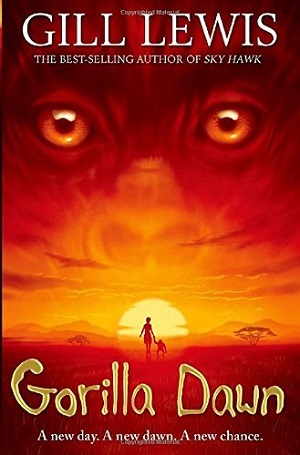 Most importantly though, despite the author’s huge amount of fantastic detail about animals on the reserve, and plants and flowers of the region (St John grew up on a farm and game reserve in Africa), she is an experienced writer and manages to keep the pace light and the plot moving forwards. Delightfully, the characters are warm, and intensely likeable, Martine in particular, as the reader is inside her head and can empathise with her guilt when she feels she has done wrong, and experience her intense emotions for both the animals and humans around her. It’s very apparent that the animals surrounding her give her enormous release, and pleasure – just as in reality friendships with animals can be a useful way for helping troubled children to heal. The subject matter is serious, and St John describes the length poachers will go to (including shooting at children), but also describes the goodness of those who will do their utmost to save endangered animals – and how important this is. This is confident and assertive storytelling that ekes out a message at the same time as telling a compelling story. You can buy it here. This is an wonderfully powerful book, dealing with an incredibly difficult subject matter for anyone, let alone children – but Gill Lewis pulls it off with some masterful storytelling and acute characterisation, pulling the reader through a quagmire of emotion from the beginning. Told from three different perspectives, Gill Lewis weaves the story of a group of guerrillas and their child soldiers as they firstly storm villages for supplies, and then settle in the mountains of the Congo to mine for coltan. During their time there they capture a baby gorilla. The first, and most powerful perspective is that of Imara, a girl captured by the guerrillas, and now a powerful entity within the camp as the soldiers believe her to be a spirit child. Gill Lewis depicts her inner turmoil brilliantly – the power she holds over the men, a power that she is scared to relinquish, and which is held in battle with her underlying conscience – fighting for what is right. When she starts to care for the baby gorilla, her love for it threatens to put her own life in jeopardy. The second perspective is that of Bobo, son of a missing mountain ranger, who infiltrates the camp in order to discover the truth about his father. Through his many years of connection to the gorillas in the mountains, he also positions himself as one with power in the group, hoping to use it in the right way. And the third perspective is that of the baby gorilla. Basic needs and desires, which as Gill Lewis cunningly depicts, are not that dissimilar to ours. The background of the lush mountains of the Congo is intensely described, especially when the men start to pull it apart in order to mine for coltan, that precious mineral that has unique properties for storing electrical charge and so is used for our phones and computers. Despite the harsh and stark message that the book delivers about our environment and our source materials, this is a gripping read and one of the most compelling stories I have read in children’s literature this year. Definitely Gill Lewis’s grittiest novel, children will be bowled over by the action, the moral argument, and inspired with a new understanding of our place in the world. Expect depiction of some gun violence, and kidnap, but it is tame enough and certainly relevant for 9+ years. Buy it here.